Modern, luxury and spacious. With new ceramic floors, high end furnishing and beautiful paintings hang around the place - will make you feel so special. Newly remodeled and highly upgraded 2 bedroom condo will give you the best comfort. The full granite kitchen provides a perfect amount of counter space that is equipped with all major cooking appliances and utensils. Have a wonderful dining experience at this beautiful wood table that seats 6 people. For more casual and quick breakfast use that bar that seats 2. Are you looking for relaxing time? This massive corner, leather couch will make you so comfortable just right in front of gas burning fire place. Large windows will not only give you abundance of natural light but gorgeous views of the mountain. Before heading to hit the slopes, check out the line for the QuickSilver Chairlft by just looking out of the window. What a convenience! Step outside on large patio to admire even more Peak 10, 9 and 8 as also the view of Maggie Pond. Enjoy the master ensuite with king bed, flat screen tv and access to the patio. Guest bedroom will also treat you with king bed, another flat screen tv and some corner seating area to enjoy the cup of coffee or a book before the night comes. Great location, clan, love the pool and restaurants on site. Very nice condo in an excellent location with fantastic views. Updated, clean and comfy. From start to finish, our rental experience was great! Very nice property with a great location. The views are incredible. We really enjoyed sitting on the balcony enjoying the scenery. it will be your glorious comeback. The place is huge and has been upgraded as described, its lit, as they say. 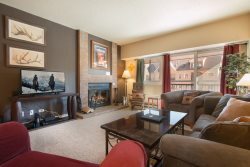 The only thing better than the location to quicksilver lift and main street, is how awesome and helpful the customer service from ski colorado vacation rentals was. stay here for sure. Gorgeous view of Peak 9. Our family of four loved staying here. It was beautifully decorated and so convenient to town and to Peak 9. We look forward to coming back next year. Beautiful condo and very large bedrooms that are not on top of each other. Great balcony! Our hosts were very communicative and provided a seamless check-in experience. It was great to be within walking distance to the Quicksilver chair and easy access to the rest of the mountain. We will be back for sure. Incredible location just steps from both lift 9 and downtown Breckenridge, great views, very clean!